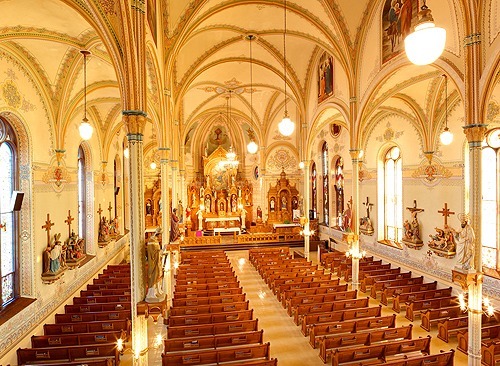 St. Mary's Church is one of the 8 Wonders of Kansas Art because of the grandeur of its lavish ornamentation, leaded windows, statuary and murals and the fact that it is the only known G.F. Satory-painted church to be so preserved! Perhaps, though, the restoration of the interior was as remarkable as the original artistry. Kansans should be proud that it was Joe Oswalt, a native of Waterville, who successfully took on the challenge of restoring Satory's interior decoration and refurbishing the oil paintings (1980-1983). Oswalt, a graduate of the Kansas City Art Institute, was inspired by the degree of perfection of the original work and sought to do a job that respected the craftsmanship of the master Satory. And it was Hoefer Stained Glass of Hutchinson that restored and releaded all the windows in the church from 1991-1996. Parishioners volunteered to erect and relocate scaffolding and support both projects. The window restoration and some masonry repair were partially funded through a Kansas Heritage Trust Grant.